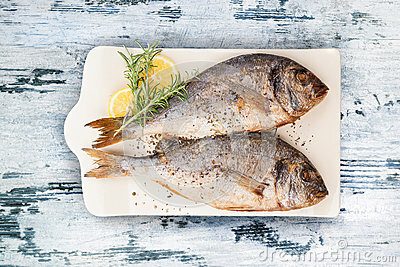 Delicious grilled sea bream fish on kitchen board with rosemary, lemon and colorful peppercorns on white textured wooden background. Culinary healthy cooking. Stock photo. Small fried fish and cut into rings of tomatoes on a slice of bread. Delicious roasted dorado or sea bream fish with lemon and fresh Prawns , fresh parsley and spinach on white platter .